There are a number of individuals and organizations that would like to see climate skepticism (aka denial) taught in schools. Our schools are places where we hope our children will be taught our best understanding of the issues. However, there are those who want to expose kids to partisan, agenda-laden perspectives that oppose our best scientific understanding. An article by Nicole Hasham in the Sydney Morning Herald, reveals that there are climate deniers working to gerrymander the educational system in Australia. Hasham mentions some Australian politicians who want skepticism taught in schools. 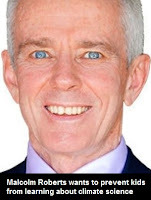 Malcolm Roberts is a hard right One Nation candidate with a strong chance of gaining a seat in the Australian Senate. Mr Roberts is a former coal mine manager who dismisses climate science and calls scientists corrupt. He wants to get rid of Australia's Renewable Energy Target and he wants to teach climate skepticism in schools. Mr Roberts is listed as a project leader in the climate skeptic group known as the Galileo Movement. Similar points of view can also be found in the US. Several organizations and individuals want to deprive children of a science-based climate curriculum. Roy White, the founder of "Truth in Texas" calls the publishers of fact based textbooks "anti-Christian" and "anti-American." Another American organization that has been trying to misinform kids and others about climate change is the fossil fuel-funded Heartland Institute. There was even a Fox News reporter who tried to use his platform to argue against climate science in schools.